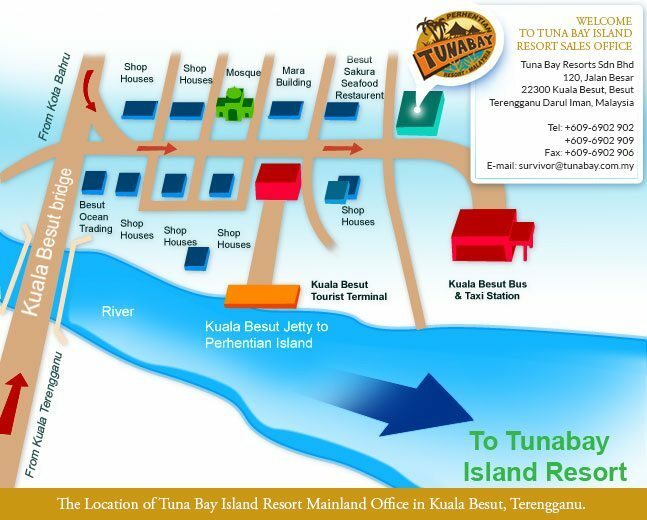 Contact Us | Tuna Bay Island Resort in Pulau Perhentian, Terengganu, Malaysia. Please drop us a line if you have any questions, we will get back to you as soon as possible. Our sales and transit office is located in the heart of Kuala Besut town and it’s only less than 5 minutes walking distance to and from the jetty. Guest is requires to come to our office for marine registration before boarding the boat to the island. It’s an office with air-conditioning and bath rooms for our guest to rest; to keep their luggage. Upon reaching the office, you will be greeted and assisted by our friendly mainland staff that will be happy to assist you with car parking space, transporting your luggage to the boat and sea transfer to the island. Guest that just returns from the island are also welcome to our mainland office if one require place for resting, keeping luggage or other assistant before making way for your next destination. The office is also operating as sales and reservation office for the resort.